I loved LEGO growing up, and I still do. I’m not ashamed to say that. Nor am I ashamed to say that I absolutely love The LEGO Movie. With the brand having been incredibly successful in the video game and short-film-for-TV markets recently, a big cinematic adventure was only a matter of time. And it doesn’t disappoint. Sometimes, animated films that play to an audience of children can be, to anyone over the age of five, either incredibly boring or the equivalent of having a heavyweight wrestler covered in glitter and feathers smash a rock into your head for two hours. And sometimes, animated films try to counter this by going over the top with jokes that play to the parents and thus bore the kids. Somehow, The LEGO Movie, in its tale of ordinary minifigure Emmet being called upon to become a Master Builder and stop President Business' evil schemes, balances elements that play to anyone. It’s a very well realised dark, dystopian sci-fi. No, really. The evil President Business rules over the LEGO city through the media, keeping everyone conforming to his instructions with an endless loop of the inane yet incredibly catchy pop song ‘Everything is Awesome’. The film’s swipes at corporate control are up there with such satirical greats as the original Robocop. Yet, as well as being a dystopian satire, it’s also an incredibly silly comic adventure. At no point does it come close to taking itself seriously, the dialogue is beautiful comic writing, and it’s stuffed to the plastic brim with laugh-out-loud visual gags. 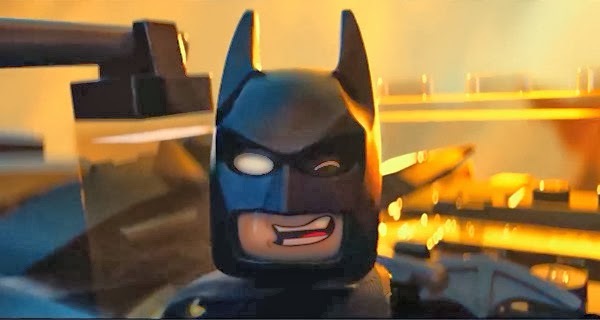 And, as well as being an incredibly silly comic adventure and a dystopian satire, The LEGO Movie is a superhero team-up movie. Batman, Superman, the Green Lantern, and Wonder Woman appear, and if these superheroes’ next adventure together is half as good, I’ll be shocked. Honestly, Ben Affleck has a lot to live up to. Besides the superheroes, a lot of familiar blocky faces show up – but saying any names would be saying too much. Outside of all this, it really has a good heart. It may resemble the kind of daft adventure kids make up when playing with their toys, but behind all this, every action sequence and every joke fits effortlessly into a very well structured script, with everything contributing to the theme of creativity and finding what makes you special. Technically, it’s very impressive too. It’s a stop-motion film, just like the ones I made when I got the LEGO Studios set for my birthday all those years ago – except with the help of the odd bit of CGI, and better. Every frame has had so much care and attention put into it. Oh, and it has Morgan Freeman, Will Ferrell and Liam Neeson in. Neeson's character is not dissimilar to the guy he plays in Taken. So, it’s an incredibly silly, satirical, heartwarming stop-motion dystopian sci-fi comic action adventure superhero team-up movie, with Liam Neeson. And it does every one of those things really well. Convinced yet? Anyone of any age will have a lot of fun watching The LEGO Movie. I haven't laughed, smiled, and sung about how awesome everything is so much in ages. Tevar 2015 Hindi Action Movie Download Link 691MB.